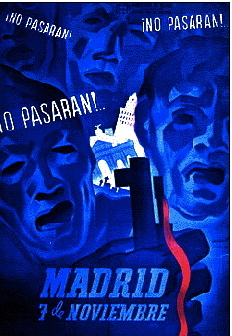 I don’t know what it is about the Spanish Civil War. Did I participate in it in a prior life, as a nurse or photographer? I was born just about the time the war was heating up, and I find it hard to believe in past life stories, no matter how fanciful and charming. However, that war and events surrounding it have always fascinated me. Always is too strong a word. I never learned anything about the Spanish Civil War in history classes at Harriet E Sayre Elementary School or Steinmetz High School in Chicago, or at any of the universities I attended (Drake, UIC and Mizzou). It’s shocking how few Americans know anything about this part of our history. I’ve had people say “Do you mean that time in the 1890s when America sent boats into Cuba?” No, that was the Spanish-American war. Kinda different. Ever since, anything to do with that war and that period has joined my list of obsessions. The great Hemingway novel, For Whom the Bell Tolls, and the somewhat-less-than-great film of the same title. Even the mediocre 2012 HBO film, Hemingway and Gellhorn. The writings of Federico Garcia Lorca and other artists of that period like Salvador Dali and Luis Bunuel. (I recommend the latter’s autobiography, My Last Sigh.) Recent films like Pan’s Labyrinth by director Guillermo del Toro keep alive the memory of the time. Into the Fire: American Women in the Spanish Civil War is a fine documentary about the 80 American women who went to Spain, mostly as nurses. The 2002 film, directed by Julia Newman, has excellent reminiscences by many of the participants. My Uncle Mort, a World War II vet, died in 2007 at the age of 96. During one of our long conversations, I quizzed him about whether any of his friends in the ‘30s went to fight with the international brigade. He pondered that and said yes, there was one named Harry. But he couldn’t remember his last name or any of his story, much to my great disappointment. I envied my friend June whose mother was a supporter of radical causes of the time. In fact, June was a so-called “red diaper baby.” Hmmm, I thought, my parents were boring Republicans (and I don’t mean Spanish Republicans). My diapers were just boring white. Today I think it’s important that we remember the Spanish Civil War, even though it may seem like a romantic notion or a foolhardy quest. It was a moment of inspirational commitment by 3,000 Americans and tens of thousands from other countries who went to fight in a foreign country for something they believed in strongly. Freedom. Opposition to fascism. The Americans had no support from their own government; in fact, they faced nothing but opposition. Those who came home (and 900 did not) were often accused of being Communists. So I proudly wear my “No Pasaran!” shirt and talk to anyone who will listen about this part of our history that shouldn’t be forgotten.